Address: 12 Miles, Tonk Road, Via-Vatika, Jaipur - 303905, Rajasthan, India. Accessibility: 5 kms. from Jaipur Airport, 18 kms. from Railway Station, 18 kms. from Bus Stand. 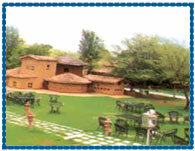 Chokhi Dhani Resort is a 5 star Ethenic resort, set in sprawling acres of land, the only one of its kind in the country with a blend of rustic environment and modern amenities. 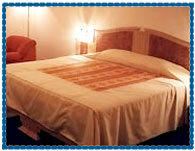 It is expressly designed for quiet, intimate moments, languorous daydreaming and restful solitude enjoyed by Thakurs. 24 Hrs. Room Service, H/C running water, Telephone, Special village tours at bissau retreat by camels, Airport/Station transfers, Doctor on call, Laundry, Money changer, Fax, E-mail, Internet access, Safe deposit, Baby sitting, Travel desk, Special museum housing antiques, Silver & Armoury, Shopping Arcade, Secretarial Service, Swimming Pool, Tennis.